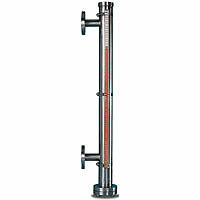 The SERIES 123 & 125 Boiler Water Level Controls are designed for boiler applications, the 123 is primarily used for low water cut-off or feed-water control. Other applications include condensate tanks and deaerators. 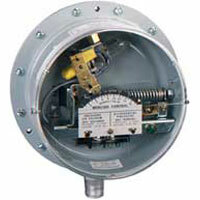 A special snap action switch mechanism eliminates frequent operation due to surging water level. A transparent cover provides convenient visible operation of the switch. Features a flanged chamber for easy clean out and replacement of float or switch mechanism without removing the unit from piping. The 125 offers the same long lasting service with a direct action mercury switch movement that provides a close deadband where needed. Body: Cast iron. Float: 304 SS. Trim and packing gland: Brass. Packing: Carbon. Body gasket: Carbon. Ambient Temperature: 212°F (100°C);Process Temperature: 365°F (185°C). SPDT snap switch or mercury switch. Optional DPDT or two stage. Snap switch: 15 A @ 120/240/480 VAC, 0.5 A @ 120 VDC resistive, 0.25 A @ 240 VDC resistive. Mercury switch: 4 A @ 120 VAC/DC, 2 A @ 240 VAC/DC. 7/8" (22.23 mm) hole for 1/2" (12.7 mm) conduit. CSA, UL. (Snap switch is not rated). 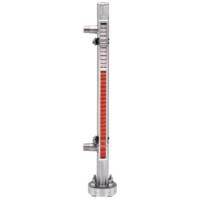 EXAMPLE 123 2 123-2 Liquid Level Control with SPST mercury switch closing on level increase, minimum specific gravity 0.88, cast iron body, general purpose case, switch rated at 10 amp 120 VAC/DC, 5 amp 24 VAC/DC, pressure rating 150 psi (10 bar), maximum process temperature 365°F (185°C). EXAMPLE 125 4820 125-4820 Liquid Level Control with SPST mercury switch closing on level fall, minimum specific gravity 0.88, cast iron body, general purpose case, switch rated at 10 amp 120 VAC/DC, 5 amp 24 VAC/DC, pressure rating 150 psi (10 bar), maximum process temperature 365°F (185°C). 4822 Consult factory for details. 4829 Consult factory for details. 4857 Consult factory for details. 5822 Consult factory for details. *Cast iron chamber is not for use with lethal or flammable substances, either liquid or gaseous.